In BBC interview, Deputy Foreign Minister says BDS 'not a human rights movement', but simply committed to destroying Israel. 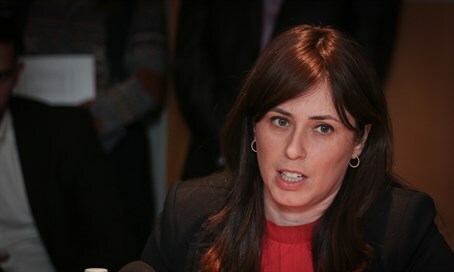 Deputy Foreign Minister Tzipi Hotovely (Likud) sharply criticized the BDS movement that seeks to boycott Israel during a televised interview with BBC on Wednesday. In timely comments that come just after the European Parliament passed a non-binding resolution last Thursday to label "settlement" products, Hotovely discussed the true nature of the BDS movement. "There are many naive people who are being misled. People think it's a human rights movement but it's not. The BDS leaders, who are interviewing all over...are saying a very simple motto: they don't care about settlements...all they care about is that Israel shouldn't exist as a Jewish state," said the deputy minister. Hotovely took apart the interviewer's comparison made when he said the BDS movement is trying to bring Israel to concessions as was done to the "white South Africa" apartheid government some 20 years ago in a global boycott movement. Noting that she just recently spoke to South Africans who support Israel, she stressed "Israel and apartheid have nothing in common." She explained that apartheid consisted of a colonialist minority controlling the majority, whereas "Israel is the Jewish state, we've got our Jewish heritage here 3,000, 4,000 years to this land." "We didn't come here as occupiers, we're coming here to our land, and the only people who are not willing to accept the idea of two people living next to each other are the Palestinians." The apartheid claim against Israel was debunked in May 2014 by none other than F.W. de Klerk, who served as the last President of apartheid-era South Africa. "I ​​would not call Israel an apartheid state. ...There are Palestinians here with full rights and representation in the Knesset, there are no discriminatory laws against them. It's not fair to call Israel an apartheid state," said de Klerk at the time during a visit to Israel.